How to Build a Robot. This article takes your through the process of building a robot. This is not for beginners. It assumes a basic knowledge of electronics, computer programming, mechanics, and fabrication. It can be dangerous. It is not for children. And teens need to be supervised by an adult. For those that want EASY ROBOT BUILDING see the links below. The series of articles that are linked to this page take you through the details in order to build that specific part of a robot. The intention of these articles is to walk you through the often difficult but always rewarding hobby of robot building, often called "robotics." We will show you how to build a robot. How to Build a Robot: With a great plan, great projects start, and a great number of projects will finish. Your plan should have drawings with measurements, and as much detail as you can put into it. You will be adding to these details as you go. You should date your notes and your drawings. You should never erase or throw out your robot plans or notes. You never know when the idea you had 3 months back might actually work with a couple of small changes. You should have parts selected, at least what you think you will need, and quick checks to see how much the parts will cost. You should also have a list of all the tools you will need. It is very possible you will need a tool that you don't own and that will mean borrowing one from a friend (make sure you return it or you will have gotten a new tool, but lost an old friend), or putting aside money to buy the tool. How to Build a Robot: You will have to either buy robot parts or assemblies or build them from scratch which is often the cheaper way to go. Scratch-built is fine if you 1. have the time (and you will need quite a bit more time to scratch build) and 2. you have the SKILLS and TOOLS to scratch build. It's a great thing that these days many parts of a robot can be purchased as an assembly just ready to plug in. If you can afford these, go ahead and purchase completed, ready-to-use robot parts and assemblies. If you work this way the time from start to a finished robot will be cut to about 25 percent. In the link below you will find a very complete list of the robot stores and shops both internet sites and brick and mortar stores where 99% of all robot parts and assemblies can be gotten. How to Build a Robot: Robot micro-controllers (sometimes spelled "microcontrollers") are little tiny computers that robots use for brains. They sometimes come with a small screen, but often require being programmed on a full PC and then the program is downloaded to the microcontroller. In times past, microcontrollers would be programmed in a very primitive programming language called "assembly language." Some still do. BUT most hobbyist microcontrollers are programmed in some dialect of the BASIC or C programming languages. They can cost as little as $11 for the ardweeny to hundreds of dollars for the high end microcontrollers. Rule of thumb: if you are spending over $75 for one, you are spending too much. Most can be bought for around $50. While some robots can be run directly from PCs, usually netbooks or laptops, most robot builders use microcontrollers, either because they have smaller robots, or wish to conserve on battery life. Click HERE to see how to read about Arduino C programming for BASIC programmers. How to Build a Robot: Arduino C is not hard to learn and if you know BASIC or PBASIC, it will be a snap. Arduino C has most C constructs with added robotic constructs such as routines to run a servo motor. The arduino microcontroller has thousands of open source (that means FREE) programs that you can use and modify as you wish. It has a lot of instructions and a lot of users. It is an ideal microcontroller for the first time microcontroller programmer. Yet, I do wish to warn you: if you have never programmed before, it would be best to get a book on C or take a class. A lot can be done without a class, but a class will put you in charge of the programming and not the other way around. A robot is not worth his salt, or perhaps his chrome if he does not have any sensors. Sensors are to robots what senses are to people. They allow a robot to be aware of his environment. There are sensors that can allow a robot to see, smell, hear, touch, and even taste (in the form of a chemical analyser), and more. Without sensors, a robot is just a remote control toy doing the bidding of whomever his holding the transmitter. Sensors are what separate automatons from robots. How to Build a Robot: There are sensors that can sense a robot's acceleration, movement, tilt, the temperature around him, his battery level, the smells around him, spoken words, and even identify objects AND peoples faces using a camera. See the link below to get a COMPLETE list of ALL the sensors available today. 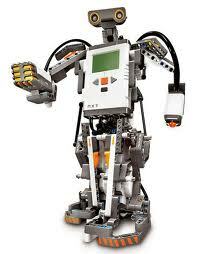 How to Build a Robot: Many robot builders are turning to servo motors for their robots. Servo motors were once used only in R/Cars, boats, and planes, but now many robot builders are using them in their robots. You see servo motors have one thing that standard DC motors don't: feedback. Feedback via a built-in variable resistor that allows some servo motors to move to any precise angle and other to turn at precise speeds. More information on these can be found by clicking on the link below. How to Build a Robot: Robot end effectors sometimes called claws, grippers or even hands, are what a robot uses to more easily interact with the world. End effectors can be as simple as a screwdriver or stylus attached to a robot or as complicated as a human-like hand. Most often end effectors are like a human's "end effectors" put at the end of robot arms. If you click on the link below, you can read about the various types and applications of end effectors. As we said before, end effectors go at the end of robot arms. Robot arms come in all sizes and shapes. some expand out, some have three degrees of freedom (places to turn). some are stiff. Some are very human-like. The point here is that the robot arm you will use with your robot will depend a lot upon what you wish your robot to do. Click the link below to learn more. How to Build a Robot: ROS, the Robot Operating System is described as so in the Wikipedia, "ROS (Robot Operating System) is a framework for robot software development, providing operating system-like functionality... ROS was originally developed in 2007 under the name 'switchyard' by the Stanford Artificial Intelligence Laboratory in support of the Stanford AI Robot (STAIR) project. As of 2008, development continues primarily at Willow Garage, a robotics research institute/incubator...ROS provides standard operating system services...low-level device control, implementation of commonly-used functionality..." Caution: ROS is not for beginners. Seasoned robotics folks will have their hands full when coming up tp speed in ROS. Like Linux / UNIX? You had better like it if you are to succeed in ROS. How to Build a Robot: Now the Microsoft Robotics Developer Studio, another robotic software development environment, "enables academic, hobbyist and commercial developers to easily create robotics applications across a wide variety of hardware" as Microsoft puts it. How to Build a Robot: Now one thing we did not discuss is robot legs. Walking robots, except for toys that seemed to have HUGE feet and still fell down have been a novelty as well as the Holy Grail of the robotics community. They are the thing that differentiates so called "humanoid robots" from rolling robots. In fact Honda (the car company) spent more than 10 years and 100 million dollars designing and getting their Asimo robot to walk. And even after 100 million bucks, (a lot of money to spend on a novelty that they will never sell) the robot still falls on his face occasionally. Of course so do people. Perhaps robots are even now becoming more human-like.